With it's cool label design (by Mitch Margo), ecletic release schedule and the rarity of particularity the later releases, this is one of the sixties most iconic and collectable record labels. 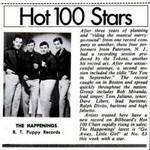 Aficionados of most styles of sixties pop will have more than a few of the sixty plus releases, with there smiling cocker spaniel puppy answer to RCA's Nipper, dotted amongst their collection. In what seemed to be an excellent marriage of creativity and commerce B.T. Puppy Records signed a 50/50 deal with Jay-Gee Records, the business arm of Jubilee Records. 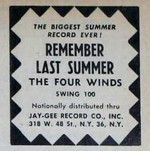 Jay-Gee would finance the recording sessions at their new studio 1790 Broadway plus take an extra percentage for overheads, office staff and sales costs etc., The Tokens had full control of their productions. More discussion of this arrangement on the BT Puppy LP's page. With the clout of Jubilee Records behind them B.T. 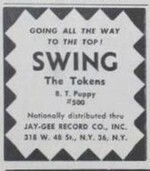 Puppy releases were being sold throughout the world, originally on national labels, Stateside, dis Vogue, Festival etc but later many countries were using their own B.T. Puppy imprint. I'm aware of B.T. Puppy releases being pressed in the UK, France, Australia, Argentina, Canada, Italy, Austria, New Zealand and Spain. This did lead to the anomaly that although The Happenings had left B.T. Puppy their Jubilee recordings were still pressed outside the US on the B.T. Puppy label. 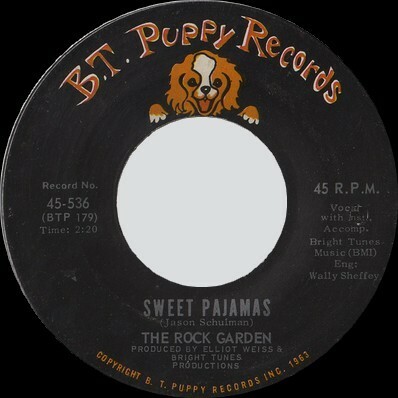 I love the B. T. Puppy record logo but besides overseas releases, picture sleeves and other graphics are in short supply. In Argentina, at least the early releases came in this very cool looking company record sleeve. *2 The Three Pennies are aka The English Muffins and the The Penny Sisters. Under the latter group name B.T. Puppy released the extremely rare "Wishing You Well" album (B.T. Puppy 1023). 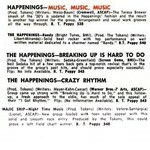 The 45 was also pressed as by The Penny Sisters and the same recordings were released a year later as by The English Muffins on (B.T. Puppy 511). *4 Alongside The Tokens productions for The Chiffons, Andrea Carroll, The Pettites, The Summits et-al the A-sides by The Cinnamons have helped cement the producer's reputation in the hearts of all girl-group collectors. "I'm Not Gonna Worry" should have started the chart run but it didn't. With the subsequent failure of "Dance To The Music" to enter the Top 100 that was it for The Cinnamons. Well, not quite, near B. T. Puppy's end The Tokens began to empty their vaults and a re-christened Cinnamon Angels had a final 45 release, "Let's Be Sweethearts". The song was easily as good as the previous two but what chance a 6 year old recording breaching the charts? None. Still, very cool that at least you have a chance to get a copy. Also released about the time of their 45 was an album, "The Satans Four & The Cinnamon Angels - Mixed Soul" (BTP/S 1010). Each artist (The Satan's Four are aka The Del Satins) gets there own side on the album with previously unreleased tracks included. All the Cinnamons cuts were written by Rufus Horton, who maybe a Ronnie Mack type songwriter who brought the group to The Tokens notice with some songs already written or perhaps it was just another pen name for The Tokens. Interestingly all the flip sides to the girls cuts feature a male lead with the girls on b-vox. I'm no voice expert but prompted by the vocal similarity and the inclusion of The Del Satins with The Cinnamons on "Mixed Soul" I'd guess it's the Del Satins lead vocalist. *5 The sleeve notes to the two "Out To Lunch" CD's by the group are rather dismissive of their time on B.T. Puppy. I beg to differ. They spent a couple of years on the label and had first-rate new material written for them, excellent covers chosen and great productions that showcased The Del Satins vocal skills but presented the doo-wop group in a very 'now' contemporary style. Many of their sides are sought not just by vocal group fans but Northern Soul and Garage Group aficionados also. As with the earlier Three Pennies and Cinnamons 45s many of them deserved to be hits. They also recorded for B.T. Puppy as The Satans Four and had one and a half albums released. See sup note *3. *6 'fraid I know nothing about this group. I've read one review that assumes they are aka The Tokens but they don't sound like the group to me. *8 First release and a non charter by the group that went on to rack a mass of hits for the label. 'Charting' side was "Greatest Moments In A Girl's Life"
The label's only certified 'Gold' record, selling a million copies. *12 Flip is a novelty duet with Beverly's 'brother'. *17 Another 'fraid I know nothing about this group. *18 I've no clue as to why B.T. Puppy 529 was not released or perhaps it was and perhaps you've got a copy? This was released in a rare picture sleeve, same photo and layout as "Why Do Fools Fall In Love". *22 Canadian band from Montreal, comprising Michael Ship lead singer and keyboards, Danny Zimmerman on bass, Marty Simon on drums and Truly Nolan on guitar. They had evolved from two earlier groups The Humdingers and Marty Simon & The Capris. Michael Ship's brother, producer & writer Neil (Ship aka) Shepherd had worked in the studio for B.T. Puppy and introduced The Scene to Hank Medress. 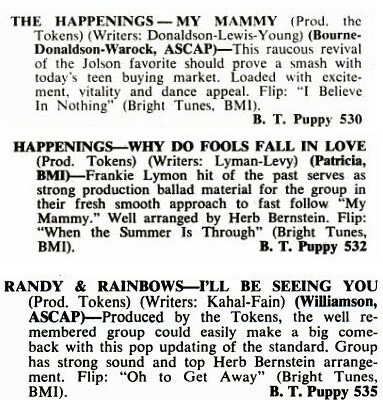 *23 Randy & The Rainbows together with The Tokens (and Neil Levenson) had cut some fabulous tracks at Rust Records but this, an uninspired Happenings styled cut was disappointing. The flips nice, The Tokens original recording, but not released until their December 5th album (or Buddah 45, whichever came first), overdubbed with Randy's lead vocal. *24 Unknown group as is the flip side songwriter. *25 You might have to get your glasses on to make out the silver writing on the green label of this B. T. Puppy Promo only release. No special sleeve but this very rare 'Thank You' note was included. *26 The group soon changed their name to The Canterbury Music Festival and you can read and hear all about them on Rain & Shine. This was released in a rare picture sleeve, same photo and layout as "Randy". *29 Despite the later matrix No's I can hear no difference between these recordings and the earlier release as We Ugly Dogs. The same appears to be true of the flip sides too many of The Happenings 45s, certainly I'm unaware of alternative versions of songs such as "When I Lock My Door" and "Love Song Of Mummy And Daddy". From this release no importance seems to be attached to the numbering. A pity, it was interesting to speculate over the breaks in the numbering sequence. Also from B.T. Puppy 552 and possibly B.T. Puppy 551 the matrix numbering sequence was changed. I do not have enough of these later 45s to make it worthwhile listing them. 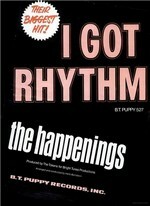 *31 Probably recorded earlier, Gerry & The Pacemakers had their last Top 100 hit with this song, reaching Billboard's No. 28 in October '66. *32 Billboard Chart No. 114 09/11/68. As Bob Miranda & The Happenings the group had one more B.T. Puppy release before they switched to Jubilee Records. *33 An okay instrumental perhaps released as a favour to their collaborator from their Randy & The Rainbows days at Rust Records. *34 Formed as The New Primitives, this New York group featured Rob Buckman, Mike Garrigan, Tommy Nikossey, Phillip Polimeni and Gus (Cosmo) Riozzi. *35 Sunbury, Pennsylvania band formally known as The Avantis consisting of Joel Cherry, Bill Gheen, John Morgan, Galen Ramsey & Steve Fecker. *36 Did you think this would be a 45 you would never hear? Think again, it must be the same two instrumentals on The Canterbury Music Festival LP. "Dorian was a live person, a real trip, who never appeared "straight", but always drugged, in a semi-circus/military costume, face coated with makeup. who was recorded by Tokens and the song was Conjugation: To Love. It was released on BT Puppy, I think. This is a great song. It conjugates the verb, to love, in Latin. The arrangement is fantastic, by Pat Williams." "The Columbia, John Simon produced Brute Force track of Conjugation: To Love is now on Bar-None as one of 5 bonus tracks added to a reissue of I, Brute Force Confections of Love. BRNCD203./ Reissue Producer Doug Wygal." *38 Formed as The Idols in their native Canary Islands, Spain, Luzardo Jose Gutierrez, Eduardo Bautista, Raphael Izquierdo Suarez, German Perez and Skunks Hernan recorded for The Tokens in 1964 as The Canaries but the results weren't released until this 45 and a LP, "Flying High with..." in 1969. *39 Outtake from The Chiffons Laurie period. Scans show a very rare Italian release, not only a wonderful picture cover, same as the Chiffons B.T. Puppy album, which David Bell had signed by Judy Craig but a far cooler b-side Ellie Greenwich, Jeff Barry & The Tokens "Every Boy And Every Girl". "Secret Love" also got an Australian release and this copy comes with "It Hurts To Be Sixteen" as the flip. Actually searching 'down under' for the later B.T. Puppy releases could prove beneficial, B.T. Puppy 551, 552, 553, 554, 557 & 559 are all noted as released on	Michael de Looper's Australian Record Labels. *40 One of the first artists The Tokens produced on Warner Bros. this 45 and his "From Me To You" LP, were more than likely produced during this period but released after he had left the label. *1 Released as The Four Winds aka The Tokens. 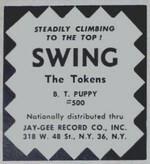 A short lived B. T. Puppy subsidiary label, Swing had just the three 45s. *2 Male & female vocal group, could be The Tokens and female singer. *3 Released as The Buddies aka The Tokens. This version of "Only My Friend" recorded in The Beatles style is very different to that on the B-side of "Cattle Call". *4 I can only assume The Tokens were caught short of two tracks when the instrumentals "On The Spot N°1" and "Shenny" (a version of "Swing") were paired with their first B.T. Puppy release on this French EP. I'm not aware of these two cuts being released anywhere else. *5 The Tokens produced a small hit with this song for The Boys Next Door and decided against releasing it as a 45 in the US. With the A-side "I Hear Trumpets Blow" the coupling made a great release for the first U.K. record label, Fontana, to license tracks from B.T. Puppy. *6 The Sanremo Music Festival is a annual competition / celebration of Italian song writing with an international reputation. During its 'golden years' the festival attracted recording artists from around the world. 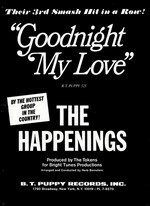 In 1967 The Happenings performed alongside Sonny & Cher, The Hollies, Bobby Goldsboro, Los Bravos, Gene Pitney, Dionne Warwick, Marianne Faithfull, Connie Francis, Les Surfs and others. The winning song that year was "Non Pensare a Me" written by Eros Sciorilli & Alberto Claudio Villa and performed by Claudio Villa and Iva Zanicchi. B-side Italian language version of their big hit, sounds to me like original backing track. Uncredited but I'd assume fairly safe to say both sides produced by Bright Tunes. *7 Alright, this didn't escape a US release but after David Bell kindly scanned the signed sleeve I had to find a way to use it. Very cool! *8 Covering The Happenings releases on B.T. Puppy and the later Jubilee recordings, mainly sans Tokens involvement, this 25 track UK compilation includes six previously unreleased tracks. 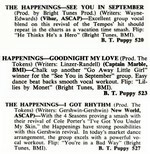 Luckily the mp3 info contains the date of recording so I'm confident the four cuts noted are Bright Tunes Productions.